An employment litigator with a long list of successful trial wins on behalf of employers, Victor Schachter ’67, a partner and co-chair of employment practices at Fenwick & West, has applied his expertise in alternative dispute resolution (ADR) to help overwhelmed judicial systems in India, Kosovo, Turkey, and other countries through the Foundation for Sustainable Rule of Law Initiatives (FSRI) that he launched in 2012. Because of its frequent use in labor law, mediation became a part of Schachter’s professional DNA. When a delegation of Malaysian judges toured the federal courts in San Francisco in 2002 seeking case management techniques, Schachter filled in for a colleague and gave a talk. His rapport with the foreign judges led to an invitation to Brazil. He loved the experience so much he continued to volunteer. One of FSRI’s biggest host countries is India. In 2005, the chief justice there enlisted Schachter to help reform a system with 32 million backlogged cases. To Schachter, this wasn’t just a crisis of case management but rather a denial of the human rights of those who might wait decades for their property disputes or divorces to be processed and settled. 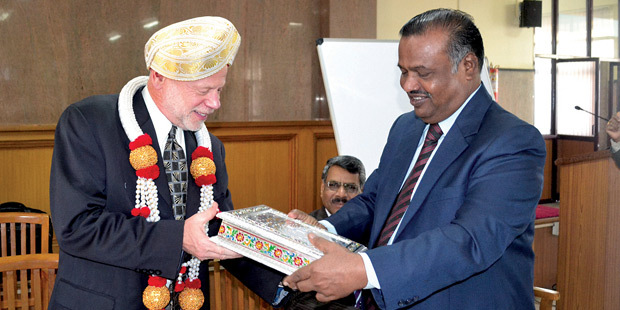 Starting with one of the largest courthouses in Asia, Tis Hazari in New Delhi, Schachter, who has a black belt in karate and prides himself on his focus and discipline, began training mediators and judges to form a court-annexed mediation program.